New Hampshire is often assumed to be the beacon of local representation. And why not? New Hampshire is the Live Free or Die state. The first colonial state to separate from British rule with its own constitution, six months prior to the signing of the Declaration of Independence. It has the largest state legislature in the nation. But the truth about local representation in the Granite State is very different. As a citizen of this state who has directly engaged with state legislators for the past four years, I can tell you that the state Legislature is beholden to party politics, not its citizens. In fact, I can tell you that New Hampshire is so dominated by party politics as to resemble the way corporations hi-jack our government and deny democracy to We the People. Educating the people on local democracy is the work of the N.H. Community Rights Network (NHCRN). As a grassroots non-profit organization, NHCRN has been advocating for the N.H. Community Rights Amendment — a state constitutional amendment that would secure the right of local communities to protect their residents and natural environment against corporate activities that violate local rights. In a nutshell, the amendment recognizes that real people, communities, and natural environments have rights to health, safety, and welfare; the authority to prohibit corporate activities that violate those rights; and ensures that local laws adopted under this amendment’s authority can only strengthen and expand rights and protections — they “shall not” weaken or constrict existing rights and protections secured by other local, state, federal, or international laws. In 2018, the N.H. Community Rights Amendment achieved a recommendation of ought-to-pass (OTP) from a Republican-controlled subcommittee. However, the chair of the full committee refused to allow the subcommittee to offer their report. The Republican-led N.H. House then denied advancing the N.H. Community Rights Amendment to the Senate. Even so, a roll call vote on the N.H. House floor revealed that one-third of the 2018 N.H. House did vote to support elevating the right of N.H. people to use their municipal governments to pass local laws protecting health, safety, and welfare of individuals, their communities, and natural environments against corporate activities that harm them. Of the one-third of the N.H. House that supported the people’s right to local community self-government, 73 percent were Democrats and 2 percent were Republicans. After last year’s show of support from Democrats and with this year’s new Democratic majority in the House, one might have expected the N.H. Community Rights Amendment to receive an ought-to-pass (OTP) recommendation. That didn’t happen. The same Democratic Party that last year supported the right to self-govern collectively at the local level when the Republicans were in charge is the very Democratic Party that this year denied a people’s vote despite its control of the House. It turns out that neither party supports the right of New Hampshire citizens to protect themselves from plutocrats hiding behind corporations and profiting by harming our communities. On the Republican side of the aisle, leadership went so far as to issue a gag order. Not only were the people’s elected representatives told how to vote on the amendment in caucus, but they were also told not to discuss it outside of the assigned committee. They were, in fact, forbidden by the political club in which they have membership from speaking or deliberating on behalf of the people. Granite State pride in a large “people’s” legislature means nothing if private political parties can control the votes and deliberations of the state representatives that we elect. Why do representatives comply? They don’t want to commit political suicide and risk losing leadership support for bills they propose. They don’t want to be politically punished for going against the party. But where does this leave the people? The answer: unrepresented in a supposedly representative republic. I’ve had state representatives from both sides of the aisle apologize to me for voting against the amendment and against their own conscience. The sentiment is thoughtful, but truly, there is no room for apologies when state legislators are elected to protect and uphold the rights of New Hampshire citizens but instead uphold and protect the privileges given to corporations that let them buy elections and politicians. This is a catastrophe for democracy and has real-life consequences. State law now legally permits among a host of other evils, activities that have elevated New Hampshire to the highest rate of pediatric cancers in the nation and the second highest rate of breast cancers. Citizens don’t want to hear apologies, they want their state representatives to represent them and not the special interests that have purchased the political parties. There are a dozen towns in New Hampshire that have passed local rights-based ordinances to protect the health and safety of people and our natural resources from corporate exploitation. Nottingham and Exeter joined the growing coalition of communities asserting their right to self-govern at town meetings this year! If we don’t act then we are ripe for getting used and abused by energy monopolies and corporate polluters! There are 850 hazardous waste sites in New Hampshire and 22 of them are on the national Superfund list. Neither the state nor federal governments have protected its citizens and Mother Nature from contamination, nor from the toxic greenhouse gasses destroying the earth, nor from the gas pipelines and fracking bringing in more fossil fuels to be burned by misguided consumers. The New Hampshire Community Rights Network (NHCRN) proposed a State Constitutional amendment in the Legislature the last two years to enable more towns to pass rights-based ordinances but the Republican-led House in 2018 and the Democrat-led House in 2019 each denied our communities the right to protect themselves. Who are they representing, We the People or the rich special interests who profit from polluting activities? The NHCRN (info@communityrights.org) is a grassroots non-profit that assists citizens and local officials to get informed and organized to promote rights-based ordinances in their towns. Get involved or be passive victims of greedy corporate polluters who are poisoning our children and planet! March 14, 2019​ By Dana DrugmandThe town of Exeter, N.H. passed an ordinance recognizing the right to a healthy climate, the second ordinance of its kind to be passed in the U.S,. The law, dubbed the Right to Healthy Climate Ordinance, recognizes the “right to a healthy climate system capable of sustaining human societies.” Exeter residents voted 1176 to 1007 to pass the ordinance at the annual town meeting on Tuesday. It follows a similar law passed by the town of Lafayette, Colo., which enacted a “Climate Bill of Rights” ordinance in 2017. These local right-to-climate laws are part of a growing movement by communities across the country to ban corporate activities that threaten residents’ health, safety and welfare. With assistance from the Community Environmental Legal Defense Fund (CELDF), more than 200 communities have passed community rights ordinances securing rights to water, a healthy environment, sustainable energy and other issues. They prohibit an array of industrial activities from factory farms and dumping of sewage sludge to fracking and building fossil fuel pipelines. Exeter, home to about 15,000 residents, is one of eight towns in New Hampshire fighting a proposed pipeline project that would transport fracked gas across the Piscataqua River Watershed, an ecosystem that hundreds of thousands of people and countless species depend upon for clean air and water. The 27-mile Granite Bridge pipeline, a project of Liberty Utility, is not specifically mentioned in Exeter’s ordinance, which instead asserts the broader right to “be free from all corporate activities that release toxic contaminants into the air, water, and soil,” including from fossil fuel extraction and infrastructure. “Our right to a healthy climate is an unalienable right. Any new energy infrastructure in our town must align with that right. We live here, and what we envision for our community comes before what any project developer and state government envision if it threatens our rights,” said Maura Fay, co-founder of the community group Citizen Action for Exeter’s Environment. Exeter joins nearly a dozen other communities across New Hampshire that have enacted rights-based ordinances, according to Michelle Sanborn, New Hampshire community organizer with CELDF. The town of Nottingham is set to vote Saturday on a community rights ordinance that includes a provision establishing the right to a healthy climate. "Our right to a healthy climate is an unalienable right. Any new energy infrastructure in our town must align with that right." Voters in Exeter, New Hampshire, fearing the impact on their community from a planned pipeline project, declared Tuesday that their town's right to a safe and healthy climate trumps corporate profits. "Our right to a healthy climate is an unalienable right," said Maura Fay, co-founder of the community group Citizen Action for Exeter's Environment (CAEE), in a statement. "Any new energy infrastructure in our town must align with that right. We live here, and what we envision for our community comes before what any project developer and state government envision if it threatens our rights." It is our legislative determination that certain corporate activities are detrimental to our rights, health, safety, and welfare. These activities include but are not limited to: the runoff from commercial use of fertilizers, the intentional or unintentional dumping of toxic waste, and the physical deposition, emission, leakage, disposal, or placement of toxins into the land, air or waterways from extraction, transportation, processing, storage, conveyance, and depositing of waste from fossil fuel exploration and development. As we are purportedly constrained by state and federal law, which courts interpret to require us to accept such harmful corporate activity, we the people of Exeter are unable under our current system of local government to secure human rights and ecosystem rights by banning said activity. Therefore, we deem it necessary to alter our system of local government, and we do so by adopting this Right to a Healthy Climate Ordinance. In August 2018, the Exeter Select Board unanimously approved an option agreement with Liberty Utilities to serve as a meter site for Granite Bridge pipeline. While some members of the board noted that this did not necessarily signal support for the project, it certainly helps Liberty continue forward on the project. Even if the Select Board and, more importantly Exeter's citizens, oppose this pipeline, it's up to the state to decide if it will be built. Warrant Article 30 accomplishes two objectives. It assures that Exeter citizens' right to a safe and healthy climate must be considered in any plans for new energy infrastructure and other corporate projects. Secondly, it safeguards that the opinions of citizens have as much standing as those of Liberty Utility or the state government. The ordinance was drafted with the help of the Community Environmental Legal Defense Fund, which describes itself as "spearheading a movement at the local, state, national, and international level to establish rights for humans and nature over the systems that control them." The group says that the proposed pipeline project would cross eight towns in the state and "threatens to contaminate the Piscataqua River Watershed, an ecosystem that hundreds of thousands of people and countless species depend upon for clean air and water." Welcoming the vote, CELDF community organizer Michelle Sanborn said, "The residents of Exeter are well-organized, informed, and engaged." She also cheered the community for "joining a growing Community Rights movement in New Hampshire." That's reflected in the proposed New Hampshire Community Rights Amendment, which says that "the people of the state may enact local laws that protect health, safety, and welfare." With a hearing before lawmakers on Wednesday, the New Hampshire Community Rights Network (NHCRN), which drafted the proposed constitutional amendment along with CELDF, is urging constituents to call their representatives and demand they support the measure. According to NHCRN, it "will be reintroduced as many times as it takes to pass it. We know from prior people's movements that fundamental change takes persistent, unrelenting pressure." ​EPPING -- Voters OK’d a non-binding resolution Tuesday that aims to give residents more of a voice as Liberty Utilities moves ahead with plans to build a liquefied natural gas storage facility off Route 101. Liberty Utilities is proposing a natural gas pipeline project called Granite Bridge that would run from Stratham to Manchester and wants to build a storage facility in Epping. The state’s Site Evaluation Committee approves such energy projects. Voters also approved a $2.19 million wastewater treatment facility upgrade (727 yes, 148 no), but rejected a $3.3 million proposal to decommission lagoons (405 yes, 472 no). Voters rejected a warrant article that sought to dissolve the town’s water and sewer commission (402 yes, 452 no). A new three-year teachers’ contract passed (592 yes, 305 no). By Deborah Sumner Feb 27, 2019New Hampshire has an amazing constitution, but sometimes it needs changing to deal with new challenges. The House Municipal and County Government Committee will hear testimony on CACR 8 , intended to codify our historical right to local self-government, on March 6. Our Revolutionary War ancestors didn’t fight for corporations to have constitutional rights; they fought for people to have individual rights and authority for collective decision making for the public good. Over the years, well-paid corporate lawyers and lobbyists have argued for corporate civil “rights” in courts and their interests in legislatures. Gradually, settled law gave way to them succeeding more often than ordinary people arguing for the same constitutionally-protected rights. “We the Corporations” by Adam Winkler shows chronologically how governing authority shifted from “we the people” to corporations and their allies. Now, we ordinary citizens face huge odds in convincing legislators to support this amendment and allow “the people” to vote on it. “We the Corporations” and well-paid lawyers have won the courts; special interests and well-paid lobbyists have won the Legislature; and big money has won the political process. As of Jan. 30, there are 88 pages listing New Hampshire lobbyists; some advocate for the public interest. Most ordinary citizens can’t get to Concord to testify at public hearings, but they still show up at town meeting when there’s an issue they care deeply about. If we find later we made a mistake, we can correct it. But that’s almost impossible if the Legislature or court makes a mistake. New Hampshire courts have recognized the “sovereign” authority of town meeting to direct the “prudential affairs” of the town, pass local laws and enforce penalties for violations dating back to colonial days. “Lering” means guiding through collective decision making locally to protect the common good. That’s what our New Hampshire and national founders intended. The social contract (our constitutions) depended on informed, engaged citizens with common sense and a fierce loyalty to protect the common good. Passage of CACR 8 reaffirms that inalienable right. Join us in standing for this constitutional codification of our historical right to protect real people, nature and the communities we love. Visit www.nhcommunityrights.org to find out more about this effort. As a citizen, I feel increasingly overpowered by corporations in decisions that impact my community’s health, safety and natural environment. Corporations are wielding their money to influence decisions in our community. Their prime responsibilities are improving their bottom line and increasing shareholder value. Hearing what local citizens have to say, and fully appreciating the impact of their decisions on a community, are not a priority. Article 30 is on the ballot for Town Meeting on March 12. A “yes” vote for Article 30 will allow the citizens of Exeter to protect the health, safety and welfare of Exeter residents and its ecosystem. Adopting this ordinance will give us the right to have a say in whether to accept corporate activity that is potentially harmful to our health and safety, and the health and safety of our ecosystem. Corporations would have to consider their project’s impact on Exeter residents and would have to answer to local citizens instead of simply leveraging their influence at the state level. A current example is the proposed Granite Bridge pipeline. Absent the Right to a Healthy Climate Ordinance (Article 30), we will have to accept new fossil fuel infrastructure in our community if the state deems this project beneficial. My favorable opinion of Article 30 is based not just on the Granite Bridge pipeline, and my favorable opinion of Article 30 is not against development in general. My favorable opinion of Article 30 is based on my need for empowerment against corporate decision-making that is based on corporate profits rather than on the health, safety, and rights of citizens. Please join me in voting yes on Article 30 - voting yes to give voice to our rights in decision-making that impacts our community and ecosystem. There are two citizens’ petitions in particular on this March’s ballot that I hope the people of Exeter will support: the Right to a Healthy Climate rights-based ordinance (warrant Article 30), and the proposal to create a Sustainability Office in town (warrant Article 34). Both of these initiatives, if voted into action by the townspeople, would prove to be major strides in the effort to create a brighter future - for our community, and beyond. These petitions are about more than protecting the sustained health of our conserved lands, curbing general trends of unchecked development, and preserving our natural resources such as air, water and soil. The petitions are concerned with all of these things, of course. But at their cores, they’re about growing resilience in our community as we proceed in this 21st-century world. It is clear that people in Exeter are committed to protecting our natural environment. However, under our current system of government, there is no way for residents to oppose corporate projects that could be harmful to the health, safety and welfare of people and our ecosystems. A Rights Based Ordinance (RBO) would correct this. It is a binding, local law that establishes a bill of rights that includes the right to a healthy climate, the right to clean air, water and soil, the right of ecosystems to exist and flourish and the right of self-government. This RBO is a tool used by communities to assert their rights when confronted by projects that may be protected by state and federal permits. It allows for community enforcement of the law as affirmed in the N.H. State Constitution’s Bill of Rights. A group of Exeter citizens have brought forth this petition with support from the Community Environmental Legal Defense Fund (CELDF), a national organization committed to fighting for the community and environmental rights since 1995. Over 200 towns across the country have passed similar RBO’s including 11 here in New Hampshire. I urge you to come to the town deliberative session on Feb. 2 to learn more about this citizens petition and then to vote “yes” on warrant Article 30 on March 12. EPPING — More than 100 residents have signed a proposed resolution aimed at giving voters more of a voice on whether they want a proposed natural gas storage facility to be built in town. A citizen-petitioned warrant article has been submitted to the town to be placed on the March ballot in response to Liberty Utilities’ “Granite Bridge” natural gas pipeline project. The article proposes a non-binding resolution asking that a storage facility for liquefied natural gas not be allowed in town without approval by two-thirds of voters. Resident Barbara Perry, who worked on the proposed resolution, said it would be a barometer to measure the feelings of residents when it comes to the Granite Bridge project. “We wanted to be able to give this information as to the pulse of Epping, as to how people are feeling about the right to decide,” said Perry, who is also one of about 40 people who are part of a group called Citizens for Local Control, which formed in response to the pipeline and storage facility proposal. The project calls for the construction of 27 miles of pipeline along Route 101 from Stratham to Manchester with a storage facility located in an abandoned quarry adjacent to the busy highway near Exit 6. The facility would include a tank 170 feet high and 200 feet in diameter, which would hold up to 2 billion cubic feet of liquefied natural gas. In its liquid state, which occurs when natural gas is cooled to -260 degrees, Liberty Utilities officials said, liquefied natural gas isn’t flammable or explosive. The project needs approval from several state and federal agencies. According to Liberty Utilities’ construction timeline, the storage facility wouldn’t be finished until 2022. Despite concerns from some opponents, Liberty Utilities officials have maintained that the storage facility will be safe. They’ve described the tank system as a “free standing inner tank surrounded by a second free standing tank designed to hold the entire liquid capacity of the inner tank.” Officials said that this adds a layer of complete containment if a natural gas release were to occur. Perry doesn’t live near the site of the proposed storage facility, but said it’s something that impacts the entire town. “We have found that many people in town are just not aware of the project and furthermore don’t even know what the project is about. To us that was concerning,” she said. State Rep. Ellen Read has reintroduced the NH Community Rights Amendment, a state constitutional amendment that expands and protects the rights of people and natural environments in their communities. The NH Community Rights Amendment was drafted by the NH Community Rights Network, with assistance from the Community Environmental Legal Defense Fund, a non-profit public interest law firm. Rep. Read said she is committed to sponsoring this legislation again because, “our quality of life, indeed our very lives and those of our children and future generations, depend on it.” Projects such as pipelines and compressor stations, transmission lines, ridgeline industrial wind ventures, and water extraction projects are authorized by state officials and state agencies, without townspeople’s consent. Efforts to protect people and ecosystems have been denied by state and federal governments in partnership with corporate special interests, leading to this legislation. Right to Local Self-Government: specifically recognizing the right of people in communities across the state to local community self-government. Rights of People, Communities, and Natural Environments: people, communities and natural environments have rights to health, safety and well-being, and the authority to prohibit business activities that violate those rights. Expanding and Protecting Fundamental Rights: people can use their collective local lawmaking power to enact local laws that protect and expand fundamental rights – any efforts to restrict or weaken fundamental rights under this Amendment are prohibited. The NH Community Rights Amendment has bipartisan support from representative co-sponsors: Vincent Migliore, Janice Schmidt, Skip Cleaver, Wendy Thomas, Nancy Murphy, William Pearson, Kathryn Stack, David Meuse, and Joshua Adjutant. Good news: Newmarket’s Town Council Water Rights Subcommittee members are recommending Newmarket’s Town Council seriously consider future resident-proposed Rights-based Ordinances (RBOs). Bad news: They’re not recommending adoption of the current resident-proposed RBO, the Newmarket Freedom From Chemical Trespass Rights-based Ordinance that seeks to protect Newmarket’s people and its Lamprey River & Great Bay Estuary watershed. Here are responses to the committee members’ assertions made during their final meeting considering the RBO. “We don’t know what unintended consequences RBOs will cause.” True, but 15 RBOs adopted by 11 NH towns haven’t had any, whereas the CDC reported in July 2018 the unintended consequences of water contamination: NH has the country’s highest rate of pediatric cancers, including state and federally recognized clusters of rare cancers in Seacoast areas contaminated by PFAS, PFOS/PFOAS, and PFCs. “We should wait until an amendment to NH’s Bill of Rights officially recognizes RBO-making so we’ve authority to instate them.” Last year, the NH Community Rights Amendment received support from 1/3 NH’s House. In 2019, Newmarket’s Representative Ellen Read will sponsor it again. If it passes NH’s House and Senate and is voted in by NH’s people, it’ll protect RBOs by recognizing people’s right to adopt them, but it won’t make RBOs official. What makes RBOs official is each individual’s inherent and inalienable right to self-determine, exercised collectively in a vote of the townspeople. Newmarket’s Town Charter doesn’t allow residents to vote on non-budgetary matters, leaving them dependent on Town Council members to adopt RBOs according to their oath to uphold Newmarketers’ rights as enumerated in NH’s Bill of Rights. Outside Newmarket, NH townspeople who can make a RBO vote haven’t waited for the amendment because they and their ecosystems cannot afford to and because they already have the inherent and inalienable authority to adopt RBOS as affirmed by NH’s Bill of Rights Articles 1, 2, 3, 8, 10 and 32. “We shouldn’t be a fiefdom telling other towns what they can/can’t do.” Protecting water is basic survival. It’s not about controlling and regulating other towns. It’s about recognizing rights of water and people everywhere. If other towns approve use of chemicals that end up in Newmarket water, and if Newmarket’s Town Council adopts an RBO banning those chemicals, then the people of other towns would deal with the RBO like they must deal with any other differing ordinances NH towns have on various issues. “What’s the point of this RBO? We’ve no direct threat.” The direct threat is that Newmarket’s people are un-empowered to vote on local governing decisions that afford greater protection than harms legalized by the state. The RBO would empower Newmarketers, their community, and their ecosystems with local governing authority to address harmful activities, even to the point of saying, “No amount of harm is okay.” So the proposed RBO’s point is its proactivity. For instance, and according to a Newmarket Conservation Commission member, town gravel pits are potentially destined to be landfills. The RBO would help Newmarketers avoid finding out decades from now, like Greenlanders have with their Coakley Landfill, that landfill leeching poisoned their water. The RBO would also help Newmarketers avoid fight after fight over harms already in town, including PFAS in their car wash’s Teflon shine service and the Town’s use of the cancer-causing Glysophate for weed control. Furthermore, Eversource’s Seacoast Reliability Project will stir up 100s of years of industry toxins in Little Bay to mix with Pease PFAS contamination already in Great Bay. While the U.S. Geological Survey and EPA determined the porousness of the bay’s bedrock, which allows chemicals to drain into groundwater from which Newmarket draws drinking water, the SEC, per NHDES recommendation, determined the project’s toxins are not concerning for surrounding watersheds. “We should just work through the regulatory agencies.” Evidenced by NHDES’s Seacoast Reliability Project approval, regulatory agencies facilitate corporate projects and allow certain amounts of harm; they don’t protect people or ecosystems. If they did, agency regulations wouldn’t require, for example, that Saint-Gobain merely provide water filters for Merrimack residents; they’d require complete cessation of the company’s PFAS poisoning of Merrimack’s people and ecosystems. But regulatory agencies won’t ban contamination because it’s neither their job nor legal place to. The people will do so because our lives depend on it and we have the right to. To learn more about Newmarket’s RBO, email monica.christofili@gmail.com or visit Alliance for Newmarket Citizen & Ecosystem Rights (ANCER) on Facebook. To learn more about 2019’s NH Community Rights Amendment, email info@nhcommunityrights.org or visit www.nhcommunityrights.org. What's the point of local government when we can't decide? Did you know that our individual right to collectively come together and cast a vote on matters that actually mean something to our everyday lives is simply rendered illegal here in New Hampshire unless the state specifically enables legislation granting local authority to pass such a law? What’s the point of local government when we don’t get to decide what is best for our health, safety, and welfare at the local level? Why bother serving for a local public office when you can be penalized and held personally liable? Laws created by the NH State Legislature are supposed to protect its people, yet truth be told, laws coming from the state legislature are denying protections for Granite State people, communities, and ecosystems. Specifically, issues of clean air, water, soil; acceptance of all human beings no matter where they are from or how they got here; food sovereignty, election integrity, waste management practices, sustainable energy choices, water quality and access, labor practices, farming practices; among many other issues, are all governed beyond our local communities while at the same time, through preemption, the state denies us any local decision-making authority over these issues, rendering us powerless to enact local laws that might help our economy or protect people and natural ecosystems. And now, it seems it is not enough to be rendered powerless at the local level to protect our health, safety, and welfare for the NH Legislature has felt it necessary to consider legislation meant to penalize local officials and hold them personally liable for acting contrary to the State in matters of local lawmaking that afford greater protections for the local community than the State allows. First introduced in 2018, HB1749 sought to penalize and hold local officials personally liable for any local legislation regarding firearms and knives that have not been authorized by the State. In House Calendar 5, page 24, Rep. McCarthy suggested that restricting such penalties to only firearms and knives is not broad enough and that local elected officials should be penalized for any and all local legislation not specifically authorized by the state. During the October 10th executive session of the Municipal & County Government committee, an amendment (2018-2139h, by Rep. McClean) was proposed that rewrote HB1749 to do just that. The amendment was not taken up by the committee this year, but don’t be surprised to see this as a new bill in the future. All of this might seem out of character for the Granite state since New Hampshire has a long history of believing we have “local control”, however, the reality of local control is far from the belief. As a colonial state, the reality of local control existed long before the state or federal governments were created. New Hampshire was the first to adopt a form of government independent of British rule in January of 1776 — six months before the Declaration of Independence was signed. However, the current state constitution adopted in June of 1784 created an entirely new form of government. One that mirrors the British rule we initially separated ourselves from. It isn’t enough to have the right to change our form of government if we don’t have the recognized authority to do so. People across the Granite State are coming together to push back against such arbitrary power and oppression with a peoples’ state constitutional amendment that would specifically recognize the right of local community self-government — the right to a system of local government founded on the consent of the people of the municipality; the right to a system of local government that secures their rights; and the right to alter any system of local government that lacks consent or fails to secure and protect the people’s rights, health, safety, and welfare. The NH Community Rights Network (NHCRN) is a grassroots, statewide nonprofit that informs communities and elected officials about our right of local self-government in order to secure and protect the inherent and unalienable rights of all inhabitants of New Hampshire to economic, social and environmental justice, including the rights of nature. To learn more about how you can get involved email info@nhcommunityrights.org and visit www.nhcommunityrights.org. NHCRN's General ElectionLocal Choice Survey Results are in! Executive Councilor, Representative, & Senator. ​on local choice before you let them know where you stand on their bids for election. Click here to read what the candidates had to say! In early October, and in anticipation of election day on November 6, NHCRN sent surveys to all 2018 N.H. election candidates running for governor, Executive Council, state senator, or state representative. The survey asked candidates for their positions on local choice, including whether or not they will support the people of N.H.’s call for the N.H. Community Rights Amendment, which last year earned support from one-third of N.H.’s House. Of the candidates who responded to the survey’s question on the amendment, 77 percent said they would support it, 23 percent that they would not. The N.H. Community Rights Amendment seeks to codify in our N.H. Constitution's Bill of Rights the community right to local decision-making authority regarding social and environmental issues that affect the health, safety, and well-being of individuals, communities, and ecosystems. While this right and authority is already affirmed in Articles 1, 2, 3, 8, 10, and 32 of our N.H. Constitution’s Bill of Rights, it is not yet specifically recognized. Enumerating this right to local self-government in our Bill of Rights would address an underlying civil rights problem in two main ways. Firstly, it would recognize that local self-determination is an inherent and unalienable right. Secondly, it would nullify the corporate use of state preemption and permitting bodies to override the collective will of a community to adopt local laws that protect people and ecosystems. Importantly, the amendment could not be used to protect local laws that restrict or weaken existing state and federal rights and protections for people. This amendment will be introduced again this coming legislative season, and as a non-profit, grassroots organization, part of NHCRN’s work will be to educate the people of N.H. and their elected officials about our individual and collective right of local self-governance that this amendment would enumerate in our N.H. Bill of Rights. The goal of this education is to help secure and protect the inherent and unalienable rights of all inhabitants of New Hampshire to economic, social, and environmental justice — including securing the rights of nature. For both summarized and full-text survey responses from the candidates, or to learn more about the community rights movement in the Granite State, please visit NHCRN at www.nhcommunityrights.org or email info@nhcommunityrights.org. With the midterm elections upon us, we are all acutely aware of the party lines that exist, "the blue wave"and the lack of bipartisanship on both sides of the aisle. However in New Hampshire there is another wave intensifying as it reaches communities across our state. It is for the benefit of all people. It is about democracy in its purest form. It is about bringing forth a Community Rights Amendment and it has been gaining momentum. Communities in our state have been targeted by corporations seeking profit over protection of people and the natural environment. Whether it be energy companies wanting to trample across our state, others dumping toxic waste and poisoning our water, water extraction, industrial wind or other harms targeting communities, the people are routinely restricted as to what they are allowed to do. They are often told by lawmakers that "we're beyond their authority" or that "it is a state issue not a local issue." This is unacceptable. This should not be tolerated. Why do large corporations possess more rights than the communities that they are doing business in? Communities need to be able to say "no" to harmful projects and "yes" to sustainability in our state. A Community Rights Amendment would elevate the rights of communities above the claimed "rights" of corporations and the governing structures that support them. It will secure the right of local self government. It will free communities from legislative ceiling pre-emption that prevents how much you are allowed to protect the health, safety and welfare of your community. This would not and is not intended to limit already protected state and federal rights of individuals. This is democracy that is rooted in equal rights for all and special privileges or advantages for none. In 2018 the proposed Community Rights Amendment garnered one-third House support and will be back in 2019. I am optimistic that in the coming year the proposed amendment will gather even more support. I believe that regardless of people's political affiliation we can agree that we live in a flawed democracy which demands that change be made to secure the rights of all people. If you would like to learn more, I encourage reader's to contact New Hampshire Community Rights Network (NHCRN) by email at info@nhcommunityrights.org or through their website at www.nhcommunityrights.org. NHCRN is a statewide, grass roots nonprofit that informs citizens and legislators about the inalienable right we have to local self government. So even though corporations are man-made, they are court-recognized as having “God-given” or “Creator-given” or “DNA-given” (fill in your worldview) rights, i.e. we have given the power of individual personhood to a special class. This reality is unseemly considering that both our federal and state Bill of Rights were written for the protection of the rights of sovereign individuals, not for a special class of people (e.g. those in a corporation) who are unified in the pursuit of special privilege, which is different than rights. Nonetheless, the recognition of corporate personhood has created special privilege that pits class against class and draws to mind the quote “a house divided against itself will fall.” Corporate personhood creates division in our country by impeding citizen sovereignty to seek public good via government that is incorporated—to quote NH Bill of Rights Article 1 — “through the consent of the governed,” meaning through the consent of individuals, not through the consent of corporations court-recognized as individuals. This division has been sowed via authoritarianism exercised under the mantle of democracy — democracy swayed in function by corporate influence. What sounds like conspiracy theory is just the people’s lobster unknowingly boiling in the corporate ‘rights’ pot. Namely, court-appointed corporate personhood has been strengthened through subsequent court rulings like Citizen’s United and Dillon’s Rule, the latter of the two generating the function of New Hampshire’s state preemption, i.e. New Hampshire municipalities and the residents in them cannot make laws unless the state says they can. But New Hampshire communities have pushed back with rights-based ordinances (RBOs) based on our inalienable right to self-govern. According to New Hampshire Bill of Rights Article 10, these RBOs reform our government, rewriting our social contract with the state by providing our communities with protection when our government is not doing so for us as it says it must in NH Bill of Rights Article 2. Almost a dozen New Hampshire towns and counting have adopted these RBOs, turning off the heat on themselves in the boiling pot of claimed corporate ‘rights’ by envisioning communities in which the rights of people and ecosystems are not subjugated to the ‘rights’ of corporations and in which corporations are welcome if they are forward thinking and innovative enough to recognize the need for and rightness of this paradigm shift. Residents up and down New Hampshire have called for a state constitutional amendment to recognize citizens’ right to self-govern for the protection of our and our ecosystems’ health, safety, and welfare. The resulting NH Community Rights Amendment earned 1/3 the NH House’s support in 2018 and will be back some time again after September’s election season. Visit http://www.nhcommunityrights.org/ or email info@nhcommunityrights.org to learn more. Encourage your district's 2018 general election candidates to take this local choice survey! NH Community Rights People's Amendment. In early August, NHCRN published the results of a survey sent to NH's state primary candidates running for Governor, Executive Council, and for State Representative or Senator. The survey asked them for their positions on local choice, including whether or not they will support the people of NH’s call for the NH Community Rights People's Amendment, which in 2018’s legislative season earned support from one third of NH’s House. 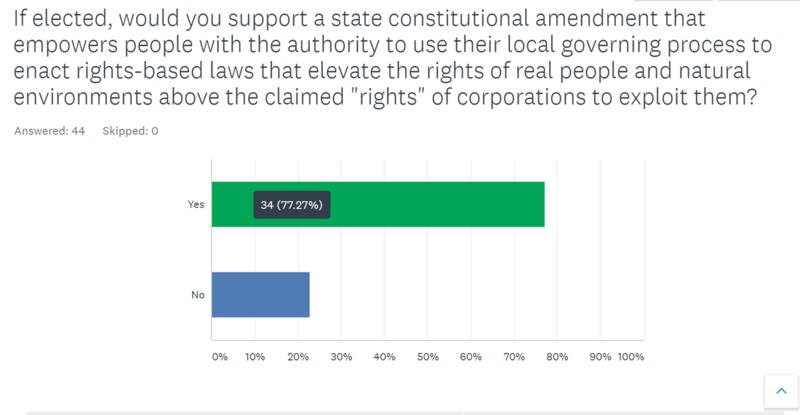 Of the candidates who responded to the survey on local choice and the amendment, 71% said they would support the amendment, 29% that they would not. With general elections taking place this November 6th, NHCRN is sending out thislocal choice survey to NH candidates still in the running to gain positions that will afford them a deciding say on whether or not you and your fellow people of NH will get the chance to cast a vote on the people's call for the NH Community Rights People's Amendment. We hope to see your engagement with it at the State House and in letters to the editor! The NH Community Rights People's Amendment seeks to codify in our NH Constitution's Bill of Rights the community right to local decision-making authority regarding social and environmental issues that affect the health, safety, and well-being of individuals, communities, and ecosystems. While this right and authority is already affirmed in Articles 1, 2, 8, 10, and 32 of our NH State Constitution’s Bill of Rights, it is not yet specifically recognized. Enumerating this right to local self-government in our Bill of Rights would address an underlying NH civil rights problem in two main ways. Firstly, it would recognize that local self-determination is an inherent and unalienable right. Secondly, it would nullify corporate use of ceiling preemption and permitting bodies to override the collective will of a community to adopt local laws that expand and protect rights of people and ecosystems. Importantly, the amendment could not be used to protect local laws that restrict or weaken existing local, state, or federal rights and protections for people and natural environments. This amendment is an ongoing topic of NHCRN educational outreach to help secure and protect the inherent and unalienable rights of all NH inhabitants to economic, social, and environmental justice—including securing the rights of nature. please join us in welcoming NHCRN's new Legislative Coordinator, Jennifer Dube! NH Community Rights People's Amendment to secure the inalienable right to local self-government for all NH inhabitants. ​EPPING -- Michelle Sanborn of Alexandria looked over a roomful of people in the Harvey-Mitchell Library Children’s Room. “Who can define what ‘community rights’ means?” she asked. About 20 people crammed into the library’s main meeting space last week to learn about their rights as citizens and the rights of property, which can’t speak for itself. The group assembled to hear what residents of the Route 101 corridor could do to stop the proposed Granite Bridge natural gas pipeline, an initiative of Liberty Utilities that would link natural gas conduits in the Merrimack Valley region with the Seacoast. The pipeline is scheduled to run along a state right-of-way through Candia, Raymond, Brentwood, Epping and Exeter, ending in Stratham. A storage tank is slated for an abandoned quarry in Epping. Sanborn, president of the New Hampshire Community Rights Network and an organizer for the Community Environmental Legal Defense Fund, was the speaker. The Community Rights Network exists to educate communities and their elected officials on the need to amend the Bill of Rights to recognize and protect the rights of local communities, she explained. Restrictions and “punishment” are making local government irrelevant, Sanborn argued, and easy to override and ignore. “What is town meeting for,” Sanborn asked rhetorically, noting the “purest form of democracy” is being superseded by state and federal authorities. And these, she said, are weighted toward corporations and not local needs or opinions. People can still fight within the system, Sanborn said, though it’s weighted against them. She and her group prefer to work through what she calls a rights-based ordinance. Several New Hampshire towns have enacted RBOs, according to Sanborn. There’s also what she calls the “rights of nature.” She noted “ecosystems as entities have the right to exist and flourish.” A rights of nature ordinance changes the status of ecosystems from right-less to right-bearing, she said, and gives them legal standing to be protected from “unsustainable corporate exploitation.” A dozen Granite State communities are partnered with the CELDF to draft first-in-the-nation laws on the rights of nature. Sanborn urged people living along the proposed pipeline to get organized, talk to their neighbors and decide what they want. Once a core group is formed, the CELDF is available to help it draft a rights-based ordinance, she said. It can then petition to have its local governing body adopt the RBO. Resident Joe Perry said a local group has been formed to oppose the storage tank. For more information, email Sanborn at michelle@celdf.org, visit www.celdf.org or www.nhcommunityrights.org. ​NHCRN Local Choice Primary Candidate Survey Results! ​44 of NH’s 2018 primary candidates responded to the survey. Below are their summarized responses ordered alphabetically by last name for State House candidates and then for State Senate candidates. If you’d like to see a particular candidate’s full response, you can click here to look it up alphabetically by the candidate’s last name. The NH Community Rights Amendment seeks to codify in our NH Constitution's Bill of Rights the community right to local democratic decision-making authority regarding social and environmental issues that affect the health, safety, and well-being of individuals, communities, and ecosystems. While this right and authority is already supported in Articles 1, 2, 8, 10, and 32 of our N.H. State Constitution’s Bill of Rights, it is not yet specifically recognized. Enumerating this right to local self-government in our Bill of Rights would address our underlying civil rights problems in two main ways. Firstly, it would recognize that local self-determination is an inherent and unalienable right. Secondly, it would nullify corporate use of state preemption and permitting bodies to override the collective will of a community to adopt local laws to protect its municipality’s people and ecosystems. Importantly, the amendment could not be used to adopt local laws attempting to restrict or weaken existing state and federal rights and protections for people. In early August, the NH Community Rights Network sent surveys to 2018′s state primary candidates running for governor, Executive Council, and for state representative or senator. The survey asked them for their positions on local choice, including whether or not they will support the people of New Hampshire’s call for the NH Community Rights Amendment, which in 2018′s legislative season earned support from one third of New Hampshire’s House. Of the candidates who responded to the survey on local choice and the amendment, 71% said they would support the amendment, 29% that they would not. The NH Community Rights Amendment seeks to codify in our NH Constitution’s Bill of Rights the community right to local decision-making authority regarding social and environmental issues that affect the health, safety, and well-being of individuals, communities, and ecosystems. While this right and authority is already affirmed in Articles 1, 2, 8, 10, and 32 of our NH State Constitution’s Bill of Rights, it is not yet specifically recognized. Enumerating this right to local self-government in our Bill of Rights would address an underlying civil rights problem in two main ways. Firstly, it would recognize that local self-determination is an inherent and unalienable right. Secondly, it would nullify corporate use of state preemption and permitting bodies to override the collective will of a community to adopt local laws that protect people and ecosystems. Importantly, the amendment could not be used to protect local laws that restrict or weaken existing state and federal rights and protections for people. This amendment will be introduced again this coming legislative season, and as a non-profit, grassroots organization, part of NHCRN’s work will be to educate the people of NH and their elected officials about our individual and collective right of local self-governance that this amendment would enumerate in our NH Bill of Rights. The goal of this education is to help secure and protect the inherent and unalienable rights of all inhabitants of New Hampshire to economic, social, and environmental justice—including securing the rights of nature.